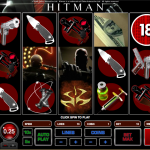 Hitman is a Microgaming video slot which is still very popular across online casinos. Even though this is an older slot the game theme is spot on and the slot design is in perfect sync with the theme. 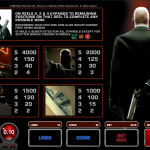 The slot is based on the popular Hitman PC game, but became even more popular once the blockbuster movie was released. The most attractive part of the game are the many bonus features and the strong pay table which can produce big payouts. 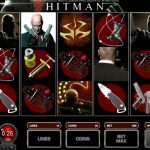 This is why Hitman is the personal favorite of many Microgaming fans, especially those who enjoy playing it at slot tournaments. The wild symbol in Hitman can land on reels 2, 3 and 4 only. Once he lands on a reel he will expand to cover it, if he can contribute to winning combinations. He will substitute for all other symbols except the scatter and bonus symbols. Once three Insignia Bonus symbols land on reels 1, 2 and 3 the Insignia feature is triggered. Here you will need to pick one of the bonus symbols and get a coin prize of up to 6.000 coins. The Contract Bonus in the game is triggered with three Laptop symbols on reels 3, 4 and 5. In this feature you will need to pick your target, which will award a random coin prize, and a weapon which will award a multiplier. After the target is eliminated you are awarded the total coin win which can range up to 270.000 coins. The slot also has a free spins bonus which is triggered with 3, 4 or 5 Scattered 18 symbols on the reels. All payouts during the free spins are doubled in size. Even though Hitman is an older slot it still has a lot to offer. With a top prize of 270.000 coins in the Contract Bonus, Hitman is well worth giving a try for real play. If you like superheroes based games then you should consider playing Hellboy a 5 reel slot by MicroGaming.